Keynote Address to "Interpret Scotland"
Interpretation can play a life and death role in community regeneration – but only with the courage to reach the deepest roots of what it means to be human. Alastair McIntosh is author of Soil and Soul and visiting professor of human ecology at Strathclyde University. This is the opening keynote address for The Vital Spark, an international conference of Interpret Scotland, delivered 1 October 2007 at Aviemore. It is wonderful to see such an international gathering here in Scotland. Thank you for coming here, and in this presentation I am going to share very deeply from Scottish culture – but I hope you will find in it a ‘Scots internationalism’ as we say, and that the points I make can be translated across cultures. 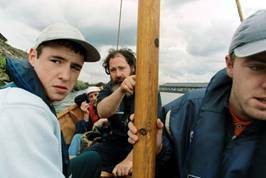 Every couple of months or so when I was in my late teens on the Isle of Lewis, word went round that “the puffer” was due in at the local seaweed factory. The seaweed was sold as an industrial gelling agent. It started off all covered in mud and maggots, but ended up refined into food and medical products like ice-cream and toothpaste. Imagine that next time you’re brushing your teeth! Our job was to shift the sacks from the factory to the puffer while the tide was high. Each bag weighed a hundredweight. It was gruelling work. Your body was left feeling like a living corpse dragged around for two days after, but it didn’t matter. What mattered was that you got an amazing thirty pounds for a few hours work – a week’s wages in less than a day. But more than that, and this is my connection with our conference theme - we also experienced The Vital Spark. 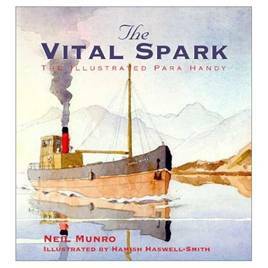 This year’s conference theme comes from the name of Neil Munro’s fictional “puffer” or cargo ship that plied the west of Scotland under the redoubtable command of Para Handy. According to Amazon’s website, he and his insuperable crew “are now part of Scotland’s genetic make-up.” Now, this vital spark that likewise entered us when the puffer came was more than just gold in a pay packet. It was also something less tangible and more lasting. It arose from the urgency and the responsibility of having to turn the puffer around before her increasing weight ground onto the rocks beneath a falling tide. As a workforce we could only achieve this by intense cooperation. The younger men, like me at first, would be assigned the lighter jobs. But as soon as we grew strong enough we’d eagerly graduate onto the heavy stuff, catching and throwing bags from off the head of the conveyor belt. It was simple work but one of those demanding common tasks that builds community. That rite of passage into the interconnection of meaningful community was the vital spark. Our capacity was tested to the limits. Our bodies became mixed with time and tide and produce of the environment. In such ways our identities developed. We are talking here about something that was able to quicken the spirit. It cut to the quick – to the source of life. It generated wealth that was not just outer, but inner. And I think that this is what we need today as humanity struggles to find sustainable ways of continuing life on Earth. Wanton consumerism is trashing the Earth. As Mark Twain put it, “familiarity breeds contempt,” and such is the nihilism demanding the generation of never-satisfied wants that we must reverse. One who thinks he can live without myth … is like one uprooted, having no true link either with the past, or with the ancestral life which continues within him … sunk in a subjective mania of his own devising, which he believes to be the newly discovered truth. This plaything of his reason never grips his vitals. Regardless of what a Scot might or might not wear under the kilt, it is that vitalism of the vitals that grabs me! I believe that people come to Scotland - and we Scots love the place - because it brings to life qualities often deadened by the hum and drum of the more mainstream modern world. Our national symbols stand for the wild, mysterious, passionate, generous, dancing, laughing, venerating and free. Like in the speech of Calgacus the Pictish king against the Romans, or in those famous words words from Scotland’s constitutional charter text, the Declaration of Arbroath from 1320 proclaiming ‘that alone, which no honest man gives up but with life itself,’ they stand for freedom. If we cringe to the skirl of the pipes, it is from freedom we withdraw. For that skirl tells “Freedom, come all ye!” to all the world. Interpretation is education, mainly informal. But we must re-ground education. The world is full of people who have been trained, but too few are educated. True education, as the Latin origin of the word implies, is about “leading out”. The secular world cannot see this for it has no metaphysical context into which to be led. But the ancients like Empedocles and Socrates got it. They saw the meaning of every life as being to express its God-given highest potential. The Greeks even had a word for this – areté – pronounced ar-et-ay - usually translated as excellence, quality, virtue, justice or the good. But more than any of these, Areté really means to fire on all cylinders as a complete human being – head, heart and hand. And as Buddha, Jesus and Burns all so clearly saw, this means firing up to a life powered by love. For GalGael the interpretation of cultural and environmental heritage is not an entertainment. Neither is it training in the narrow sense of that word. Rather, it is a matter of calling back the soul with those whose lives have rendered them the canaries down the noxious mines of communities poisoned by poverty, racism, sexism, sectarianism and the class system; poisoned by the knock-on intergenerational traumas of the wounded and stunted human heart.